The increasing interest in bush tucker amongst non-Aboriginal people has highlighted the use by Aborigines of the resources of many habitats in Australia. There has been an upsurge in respect for knowledge held by Aborigines, which demonstrates a fundamental change in attitude towards Aborigines and their skills and talents. 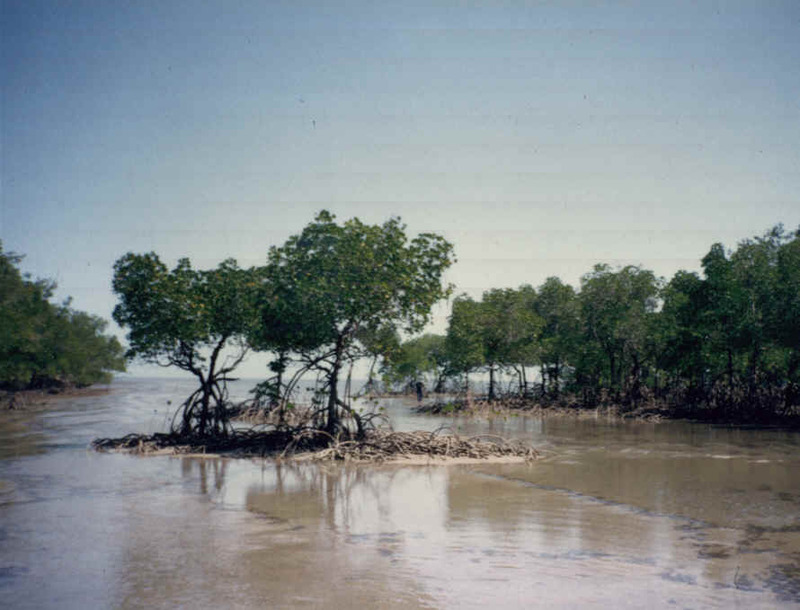 Coastal Aborigines in the northern Australia are major users of the mangroves, where there is an abundance of animal and plant resources. There are three potential types of use for plants in a traditional society, for food, for medicines and for other purposes including tools and weapons. Table 1 lists some of uses of mangroves made by Aborigines in northern Australia. The uses vary from place to place, depending on which species are present locally and the experience of the Aborigines there. There does not appear to be much shared knowledge even between adjacent groups; this is probably a consequence of groups using the mangroves in isolation whereas in other environments they are more likely to come in contact with other people. Table 1. Traditional uses of mangroves and other plants in the mangrove habitat by Aborigines. Uses of mangroves vary from place to place and locations are given for uses in specific uses. This table is not comprehensive and comes from a variety of sources (see References). Mangrove plants are not commonly used directly as a food source, probably due to the high levels of tannins and other distasteful chemicals. There is processing of the hypocotyls of some species as a food source (eg, Avicennia marina). This process is common knowledge to many coastal groups, but is unknown to people from Groote Eylandt and Kalumburu, for example. It was suggested that this is because Aboriginal diet was culturally determined and when Aborigines migrated into new areas they did not necessarily experiment with new foods, but in the case of the Wardnindilyakwa people from Groote Eylandt, sea level changes isolated them on the island and there was a major change from fresh water to marine as the Gulf of Carpentaria flooded. Because mangroves are flowering plants, the flowers are a likely source for honey; native bees are found in the mangroves during the various flowering seasons, and these are exploited now by commercial apiarists with their exotic bees. A. marina is probably the only mangrove where bees build hives, but there are other trees found in coastal areas, such as Peltophorum pterocarpum, where hives are built. Expertise in using mangroves for medicinal purposes has been acquired over a long period of usage. The techniques which are used vary from plant to plant, and often between groups of Aborigines. In some cases the plant, or its sap, is used directly. In other cases the leaves may be heated, or the plant material burned to an ash for application. Western science is beginning to isolate the active ingredients for some of these treatments. Because of the intertidal nature of the mangrove environment, there is an associated movement of fish and other animal species into and out of the mangroves, as well as their presence there as larval forms. There is also seasonal movement of some animals, particularly birds, to and from the mangroves. It is not possible to generalise whether some of these animals are mangrove or offshore resources. The main vertebrate components of the mangrove fauna are the fishes and birds, which are mostly transitory. Beside spearing fish, Aborigines made use of various types of fish traps, including rock traps which were often located near mangroves. The mangrove monitor (Varanus indicus) is a popular food taken in the mangroves. Other reptiles which are found among the mangroves are the estuarine crocodile (Crocodylus porosus), other goannas and skinks, and snakes such as the Bockadam (Cerberus rhynchops), as well as sea snakes. There is a number of birds found in and around the mangroves, and fruit bats, but vertebrates are not the major food resource in the mangroves. Crustaceans and molluscs are the main two invertebrate groups which are exploited by Aborigines as a food source. Most of the hunting in the mangroves for these animals is done by women, often with children in tow. The mud crab, Scylla seratta, is an important food source and is eagerly hunted, using sticks to extract the crab from its hole. The crab is quickly disarmed by removing the main claws, and is usually cooked straight after hunting finishes. There are other crabs in the mangroves but most of these are not hunted as they are comparatively small. The mud lobster, Thalassina anomala, common throughout the mangroves, is not eaten. Prawns and shrimp are other components of the crustacean fauna of the mangroves but usually occur in small numbers. Most of the molluscs that are exploited are either gastropods or bivalves. The chiton, Acanthopleura gemmata, is exploited by some Aborigines (as well as other ethnic groups). It appears that there are no cephalopods exclusive to the mangroves, and although some cuttlefish are often found there at high tide, there is no evidence that they are exploited. There are a number of species of gastropods which are exploited, and two of these (in some centres only one) are commonly called "long bums". These are Telescopium telescopium and Terebralia palustris (and maybe Terebralia sulcata), and they provide a major part of the bush tucker which can be collected in most mangrove areas in the Northern Territory; both are epifaunal browsers. Another component is the periwinkle, Nerita lineata, which is commonly found on the prop roots of Rhizophora stylosa. Another gastropod which can be found is Volegeala wardiana (also known as Pugilina cochlidium). Two other species of gastropod commonly found in the mangroves are not eaten, Littorina scabra ("too small") and Cerethidea obtusa. Most shellfish are usually cooked in the coals of a fire, although sometimes they are boiled in a billy. Some Aborigines eat T. palustris raw. Other gastropods which are found around the mangroves include the slug-like Onchidium spp, of which there may be four species. These are boiled in water which can then be used to treat earache. The oyster Saccostrea scyphophilla is one species of bivalve which is often found attached to the prop roots of R. stylosa or to rocks at the same level. These are usually collected as bundles of shells and cooked in the coals. There are a number of other bivalves which are found in the mangroves or the mudflats immediately in front of them, as infaunal browsers. These are extracted from the mud and cooked in the coals of a fire. They are usually arranged in an orderly pattern to allow them to open without wasting the cooking juices. An important bivalve which is found in dead and decaying mangrove wood is called "mangrove worm", Teredo spp. The action of the shells moving together excavates a hole through the wood, and the wood shavings accumulate in the stomach which becomes a distended, worm-like bag. The mangrove worm is chopped from the wood using an axe and is eaten raw. 1. This is adapted from Michie, M. (1993). The use of mangroves by Aborigines in northern Australia. Channel Island Field Study Centre Occasional Paper, No. 5.